 Like its hometown ABC Network rival WSB-TV Channel 2 , Atlanta's Fox 5 ended its analog telecasting at 12:30 PM local time with a gathering of station personnel around the transmitter. WAGA-TV's honored guest is 99-year-old Paul Cram, the station's original chief engineer that pressed the button to turn on Channel 5's analog signal back in March 1949. Mr. Cram reminicses about the first years of television in Atlanta for about 45 seconds before he presses the button that cuts the power to the analog signal, seen here as the "blue screen of death". During this, Fox 5 is running a crawling text message warning analog viewers to get converted to receive digital.